A dramatic, fast-growing Japanese flowering cherry variety, Fragrant Cloud (Prunus 'Shizuka;) has a spreading slightly ascending habit. The huge clusters of large, white, semi-double flowers are borne in masses on the tree during May and turn a delightful pinkish as they age. 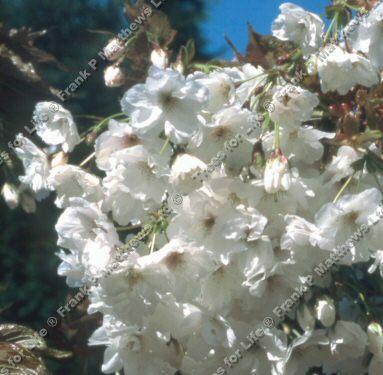 The flowers are also slightly scented, which is unusual for a flowering cherry. As an added bonus, Autumn sees the leaves turn an attractive orange before shedding. Fragrant Cloud is supplied at a height of between 1.5 and 2.40 metres in a 12 litre container for year round planting and better results than from either bare-root or rootballed stock.